Background: For the narrow therapeutic index anti-epileptic drugs, monitoring of plasma concentration is a necessity for avoiding complications related to fluctuation of plasma level. 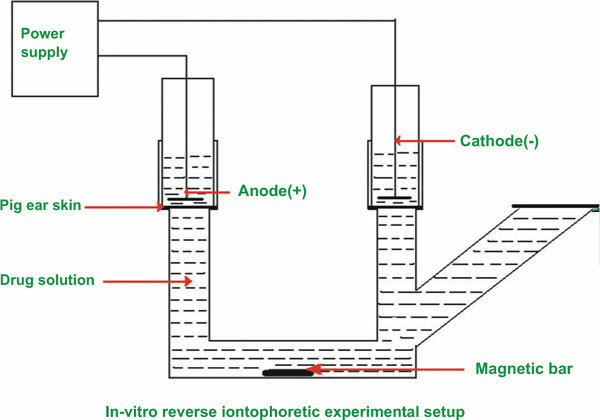 Objective: The work was aimed at extracting gabapentin by transdermal reverse iontophoresis to investigate its feasibility for noninvasive therapeutic drug monitoring. Methods: Gabapentin was delivered in phosphate buffer (pH 7.4) at a therapeutic concentration range of 2-10 µg/ml. The same media was also used in receiver compartment. Extractions were carried out under an electric field of 5 V (current intensity range 0.3 -0.5 mA/cm2), provided by a custom-made power source for a period of 4 h. Samples were withdrawn at hourly intervals and drug content was analyzed by HPLC. Results: Results indicated that gabapentin extraction occurred at both anode and cathode with cathodal extractions showing higher value at all concentrations. Extraction rates at both the chambers were affected by time, the first hour extraction was notably higher than the later hours. Highest extraction rate was noted at pH 5. Surprisingly, anodal extraction was found to show greater positive correlation with current intensity compared to cathodal extraction. Conclusions: As gabapentin carried no net charge at pH 7.4, orientation mediated electromigration was suggested to be the cause. Gabapentin, reverse iontophoresis, electroosmosis, transdermal, epilepsy, zwitterion.